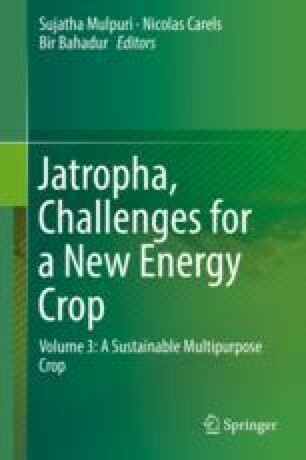 This chapter reports on the characterization of the by-products of oil extraction in Jatropha curcas L. and their usage as energy sources. The biomass and the technology, such as thermoconversion (combustion, pyrolysis, and gasification) and biological routes (anaerobic digestion and alcoholic fermentation), available to convert these by-products in energy and other types of fuels, are presented. The oil extracted from seeds accounts for ~35.1% of their dry weight. The de-oiled cake presented the following characteristics: 8.64% moisture, 39.38% cellulose, 21.18% hemicelluloses, 9.67% lignin, 93.55% volatiles, 0.86% fixed carbon, and 5.59% ashes. The higher and lower heating values (HHV and LHV) were 23.08 MJ/kg and 22.87 MJ/kg, respectively. The de-oiled press cake pyrolysis was performed in a bench-scale fixed bed pyrolyzer at 700 °C, 800 °C, and 900 °C in argon atmosphere. Pyrolysis gaseous fuel showed high hydrogen and methane yields, ranging from 41.10% to 43.47% (mol/mol) and 21.82–23.71% (mol/mol), respectively. The lower heat contents of the gases produced by pyrolysis were 16.76, 16.43, and 16.53 MJ/m3 at 700, 800, and 900 °C, respectively. A total energy balance of the J. curcas products and by-products was performed, and the results showed that the best energy route was to produce biodiesel from seeds and energy from direct combustion of residual biomass to generate heat. However, other routes can be used depending on the applications.